"In this brilliant and timely book, Michele Borba brings into sharp relief the key skill for children making it in the twenty-first century -- empathy. This beautifully written, eminently actionable book will inspire parents and their children to take on the complex issues of our twenty-first century guided by the power of empathy and kindness. This book offers a roadmap to a much brighter future." 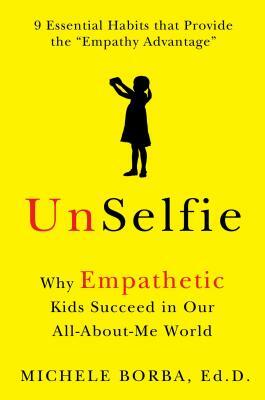 "UnSelfie is an absolute must-read for parents. Want your children to be both caring and successful? UnSelfie shows you how, with easy to implement techniques grounded in the latest research. It turns out that empathy-- understanding other people's feelings -- is not just "nice," but one of the most useful skills your children can learn. An engaging read with vivid stories and practical advice, UnSelfie is the most important parenting book you will read this year." "Once again Dr. Michele Borba has written a book that is not only 'good' but essential. By writing about empathy in the context of our children's increased technology use, Dr. Borba penetrates the often hidden world of electronics. She does so with a science-based perspective that mirrors our own common sense. UnSelfie is a must-read for parents, teachers, and policy-makers." “Michele Borba has written a game-changing guide showing why nurturing empathy in our children isn't optional -- it's essential. This groundbreaking book is an invaluable tool for parents and educators in their quest to raise compassionate, kind, and courageous children in a culture whose only success metric are grades, trophies, and resumes. For our children’s sake, I hope parents heed her sound advice to raise UnSelfies." “Empathy helps us develop true friendships and have a happy life, and Michele Borba’s practical insights and advice are a huge help for parents who want to nurture this essential skill in their children." "In this era of increased technology use, UnSelfie emphasizes the important reminder that kindness, caring and being genuinely connected to others is critical for children. Parents are their role models and teachers in this arena. Borba offers numerous suggestions for helping children develop and exhibit empathy and helping families find ways to connect to each other with digital-free activities. A great read." In Unselfie, Michele Borba boldly takes on the mistaken modern myths and practices that may lead today’s young into the traps of self-absorption, and she offers us a better way. Michele Borba has the rare gift of being able to take insights from cutting-edge research on empathy and character development and turn them into how-to strategies that any parent or teacher can use tomorrow. Every generation has a few child rearing experts who become the go-to persons for wise advice on the toughest challenges facing families and schools. In our time, and around the world, no one is a more trusted voice on character and child behavior than Michele Borba. And no one is better equipped to help us raise more empathic, kinder, happier kids. Parenting expert Borba (Building Moral Intelligence) traveled the world and researched for decades before writing this fresh and powerful primer on raising caring kids. The book came into focus, she explains, while she was visiting the Cambodian killing fields outside Phnom Penh. Her resultant goal—find out what causes inhumanity and how to stop it—led her to visit Dachau, Auschwitz, and Rwanda, as well as school classrooms. By consulting current research, she discovered that a strong sense of empathy is not only a moral imperative, but also an advantage in attaining health, happiness, and career success. In separate chapters, Borba presents nine essential empathetic skills: emotional literacy, moral identity, perspective talking, moral imagination, self-regulation, practicing kindness, collaboration, moral courage, and compassionate leadership abilities. In each section, she provides a wealth of exercises, activities, and age-by-age strategies to help parents nurture empathy—a trait, she stresses, that is not innate but can be taught and developed. With narcissism and self-absorption on the rise in our digital age, she argues, this trait is in danger. Her thought-provoking and practical book may very well tip over the parenting priority applecart—and rightly so. “Michele Borba makes a strong case for empathy as a tool that can be taught to kids, positioning them for success. . . . When you have empathy, it’s like cutting through the mess and getting straight to what drives 99.9 percent of most people: a need to be understood, valued and loved."